FAQ: What options do you have for diesel fuel storage tanks? Question: I am looking for diesel fuel storage tanks. What do you have? Answer: For the storage of diesel fuel, there are a few different options you can consider depending on the amount of fuel you need to store. For large amounts, a great option can be one of our flexible fuel tanks. 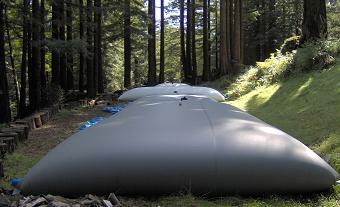 These large capacity tanks can store up to 210,000 gallons and can be shipped in a small, low-bulk package. See more Fuel Storage Options. For more information, visit our Pillow Tank page. In addition, many customers have also checked out our Steel Storage Tanks. These durable units have fuel and chemical models available to help store and transport these liquid materials.